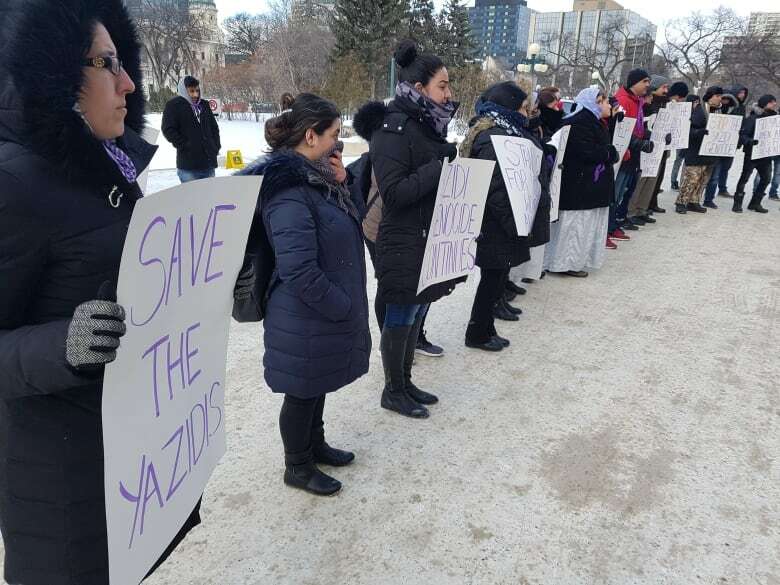 Members of Winnipeg's Yazidi community gathered on the steps of the Manitoba legislature for a rally Wednesday afternoon, calling for action to help those threatened by ISIS. The discovery of a mass grave containing the decapitated bodies of dozens of people in Syria — mostly women believed to be members of the Yazidi sect — has refugees in Winnipeg calling on the Canadian government to act. 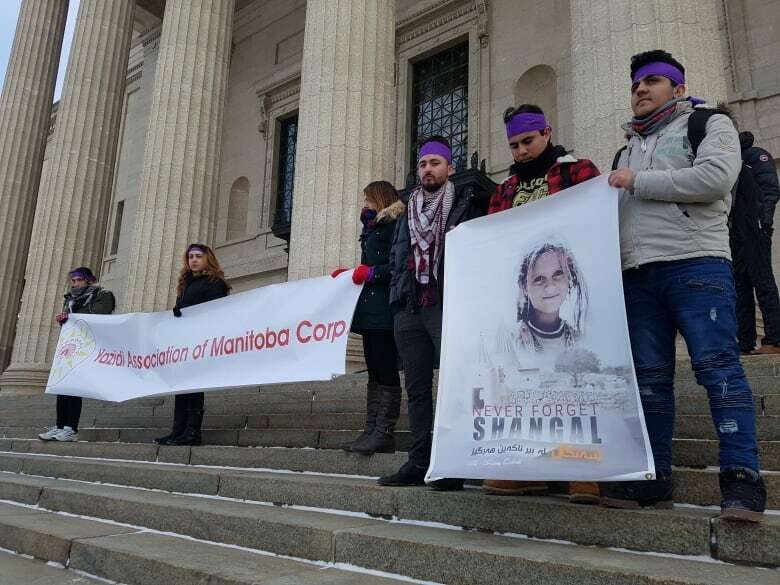 Several dozen people gathered on the steps of the Manitoba legislature for a rally Wednesday afternoon. 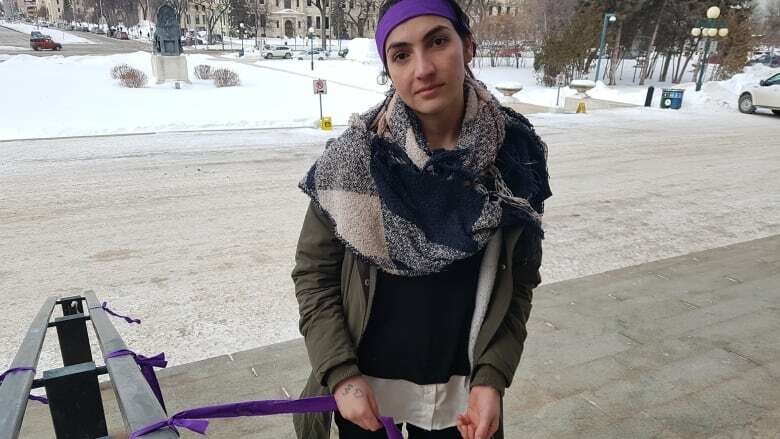 "Our message is clear — to help the international community raise the awareness, help the remaining people that are still captive, still missing," said Nadya Omar in Kurmanji — the Yazidi language — as translated by Yazidi Association of Manitoba director Hadji Hesso. Yazidis are a religious minority who were targeted by ISIS fighters in Iraq in a brutal campaign described by the United Nations as genocide. More than 3,000 Yazidis were killed in northern Iraq in 2014, and nearly 7,000 women and girls were abducted and sexually abused. Omar was among those captured, but managed to escape and eventually make it to Canada. Hesso said there are many left behind. "Every time we hear a story about one child or when women are returned, we're hoping that we know there's more," he said. "That's why we're calling on the government to … help us, to find those people. Where are they?" People at the rally wore purple scarves to symbolize the purple veils many Yazidi women wear. In recent weeks, U.S.-backed Syrian rebel forces have nearly pushed ISIS out of its last remaining territory in eastern Syria, around a town called Baghuz, near the border with Iraq. The mass grave was found in an area recently seized by the rebels, according to a Reuters report. Omar said the discovery brought her back to Aug. 3, 2014 — the day ISIS first attacked her home. "It just kind of repeated itself — a genocide after the other one that happened to the Yazidi people." Canada has taken in more than 1,400 refugees through a special program for victims of ISIS, 85 per cent of whom are Yazidi, a spokesperson for federal Immigration Minister Ahmed Hussen told CBC News in a statement. 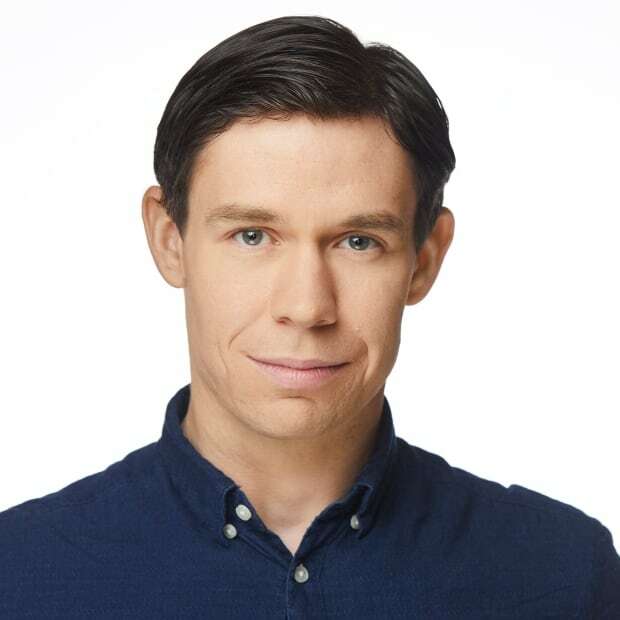 "These women and girls have endured and survived unimaginable trauma and face long journeys towards healing and rebuilding their lives in Canada," said Mathieu Genest. The government has worked with community partners to provide specialized support to the Yazidis, including counselling and mental health services, provided through a refugee health-care program. It has also extended the one-year window for Yazidi refugees to sponsor a relative to come to Canada, and continues to fast-track applications for privately sponsored Yazidi refugees, Genest said.